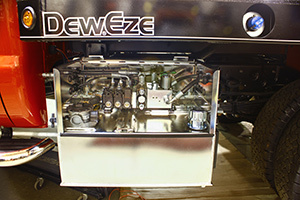 Harper Industries introduced the DewEze Valve Tank (VT) series system, featuring a PosiFlow reservoir. This tank-mounted valve system can be fitted to any light- or medium-duty truck. The VT Series can control up to seven actions, including a spreader, to operate a fully loaded snow and ice management vehicle. It is a self-contained valve system featuring a weather-resistant compartment that helps prevent chemical corrosion, while allowing easy access to the valve. The VT Series is available with three coating options–painted carbon, a polyurethane coated steel or stainless steel–depending on the end-user’s application requirements. The DewEze VT Series’ priority inlet allows end users to prioritize how much oil is sent to a specific action. With the priority inlet, users can adjust the flow of oil for a more controlled action, regardless of the truck’s RPM, the company said. The VT Series is available in several configurations. Users can choose from double- and single-acting valves, electric and manual valves, central systems, plow and hoist, electrical spreader controls and more.